I have to say that taking part in this project with the ‘Lamb. Try It, Love it’ campaign has definitely made me more inclined to buy and cook lamb. Six months ago lamb was one of those things that I would eat if I was in a restaurant but not something I would buy to cook at home. I always figured that lamb was probably a bit too expensive for me, or that I wouldn’t know how to cook it well, but turns out I was wrong on both counts. Even something like an overnight lamb curry doesn’t have to be complicated, as I’m about to show you. Curries are a bit of a funny one in my mind. Either you buy a ready made sauce in a jar, (and quickly hide it at the bottom of the recycling so no one sees it), or you cook from scratch with a list of about 49 different exotic ingredients. 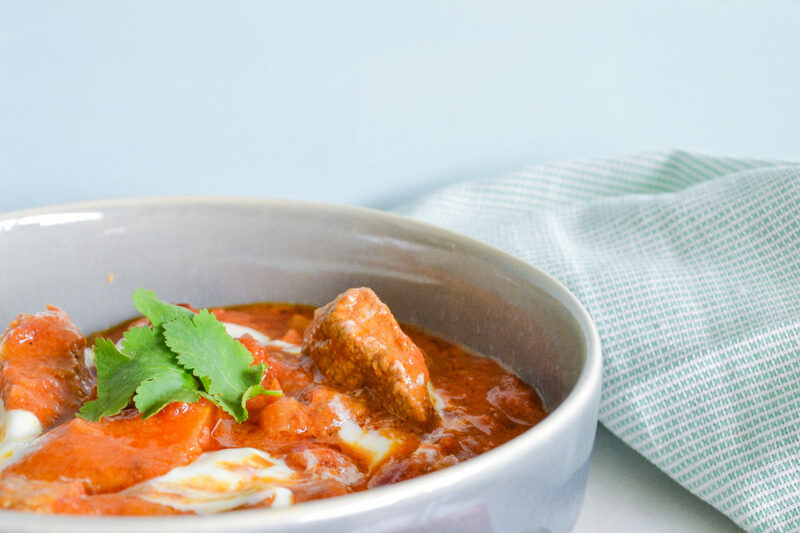 I wanted to create a middle ground – an easy curry recipe that you make completely yourself, (smug points), without having to completely restock the spice rack. Even better, you can play around with it according to your personal taste. 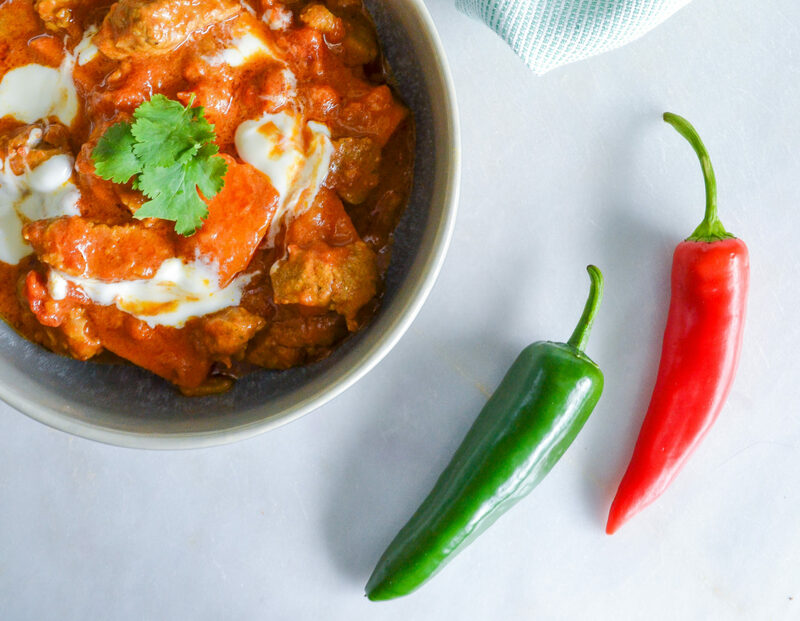 In this recipe I’ve gone for a really mild curry that’s about flavour rather than heat, but if you wanted to spice it up a bit you could add chilli powder into the marinade overnight, or chuck in some chopped, fresh chillies when you add the tomatoes. I used lamb shoulder for this curry, which has a lot of flavour and suits being cooked for a couple of hours, and I found it in Sainsbury’s for £5 for 400g. By adding sweet potato into the mix, you make 400g of lamb go that bit further, creating four generous servings for really not much money at all. 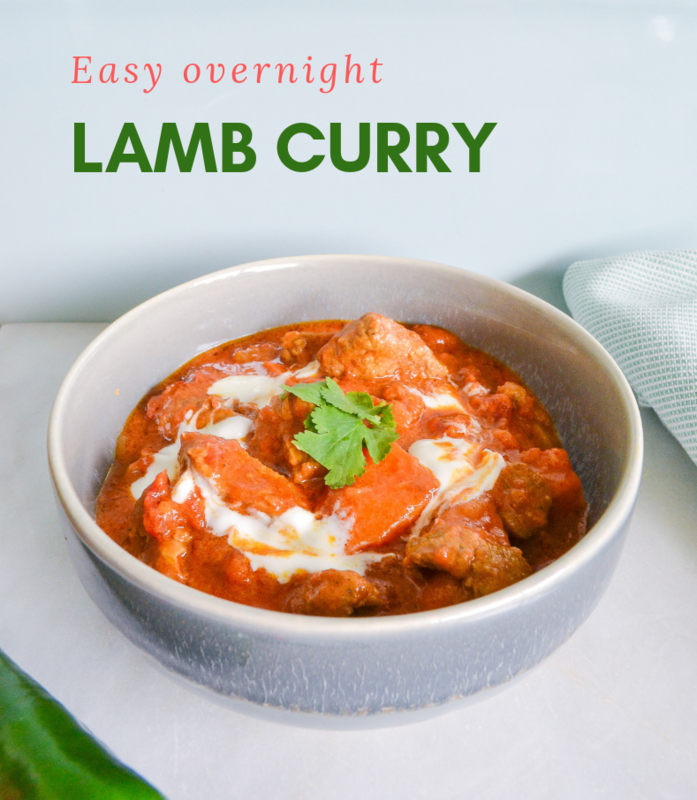 Another great thing about this lamb curry is that a lot of the prep can be done the day before, so when it comes to the actual cooking there is barely anything to do at all. 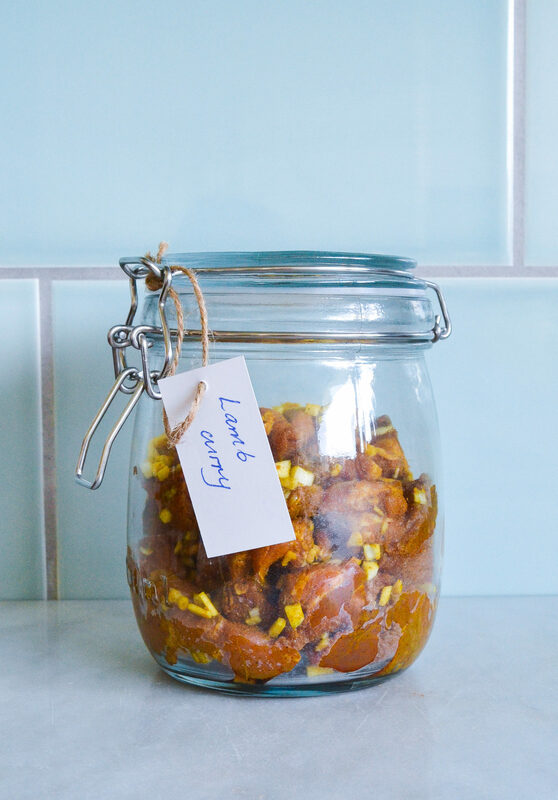 Start the day before you want your curry by marinating the lamb. For this, crush, grate or finely chop the garlic and ginger, and add it to a bowl with the lamb, garam masala, cumin and turmeric. Add some chilli powder at this stage if you want a little heat. Give it a good massage, and cover and store it in the fridge overnight. The next day, your lamb will be full of flavour, ready to go. Heat the oil in a sturdy pan, and then add the onion. Fry for a few minutes until it starts to soften. Add the marinaded lamb, making sure to add in any leftover bits of garlic and ginger. Fry for about five minutes until the lamb is browned. Add the tomatoes and the coconut milk, and crumble in the vegetable stock cube. Give it all a good stir, lower the heat, pop on a lid and simmer for an hour. (You might want to check on it and give it a stir every so often so it doesn’t stick.) After an hour, add in the sweet potato chunks and simmer for another half an hour or so until the sweet potato is cooked through and the sauce is thickened. To serve, top your lamb curry with a blob of natural yogurt and some coriander. Serve with rice or naan, or sod it, have both. YOLO. Get more lamb recipe inspiration here.